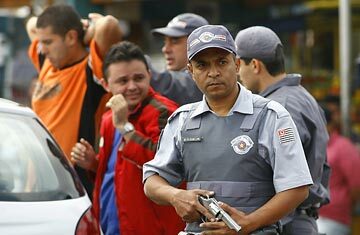 A police officer takes his position as others frisk suspects in São Paulo, Brazil, May 2006. Brazil's Lula: A Bridge to Latin America's Left? When hundreds of bodies suddenly began turning up in São Paulo in May 2006, many people suspected a secret war had taken place. There had been a very public initial skirmish when members of a gang known as the PCC had spent two days and nights terrorizing South America's biggest city, killing at least 33 law-enforcement officers and transforming São Paulo into a ghost town where 20 million people cowered behind their locked doors and barred windows. But more fresh corpses began turning up in the six days after the police had restored order than during the gang-induced chaos itself. The families of those killed are frustrated at what they believe is the police's refusal to more seriously investigate their claims and say that if the federal government does not intervene they will go to the Inter American Court of Human Rights and put Brazil on trial. More than half of the cases have been officially closed by the authorities, in some instances even after relatives pointed out discrepancies in the officers' reports. The mother of Rogerio da Silva, Debora da Silva, refuses to give up the fight. Da Silva says nine men killed her son after stopping him at a gas station. She recounts that they asked him if he had any previous convictions and when he responded that he had once spent two years in jail for armed robbery, they allegedly told him his time was up. The 29-year old was ambushed as he drove away and shot four times, da Silva says, citing eyewitnesses at the scene. She says it was eyewitnesses who told her that some of her son's assailants were cops. But she says her sources and other witnesses are too scared to testify. In addition, the gas station stymied her attempts to secure its CCTV footage for seven weeks and when they finally handed it over, the tape had been erased. She claims the police changed the story on their official reports. When she called for the officers to be tried for homicide, officials said they could not try all nine without knowing who pulled the trigger and closed the case. "The state needs to give us answers," da Silva says. "We want an ethical public-security policy." Police chiefs have so far refused to comment on the report, but the authorities have defended officers and pointed out that it was not the police that closed the cases but judges. The mothers and families of the dead vow to keep on fighting.